Does one customer represent 100 percent of my revenue? Sure, it’s great to have a big contract with a big company. But how do you know when you’re too dependent on that one relationship? Find out. You probably saw the recent announcement by once-high-flying Zynga that it is laying off 20% of its workforce and closing offices world-wide because of slumping revenue caused by an over-dependence on Facebook as a marketing channel. This is a high-tech equivalent of a growth trap that can happen to any fast-growing business. I call it The Wal-Mart Effect. Although the numbers vary somewhat from industry to industry, unhealthy things start to happen once one customer reaches 20 percent or more of total revenues. Any higher than that and you are in real danger of falling prey to the Wal-Mart Effect. You notice that weekly management meetings comprise little more than a punch-list of their outstanding production or delivery issues, and even so-called strategic meetings start and end with everyone talking about the 800-lb gorilla. Doorway and water-cooler chats are about –guess what? Our single big client, and everyone’s daily agenda is pretty much centered around what they’re screaming for most, today. Schedules get burned, internally-set priorities melt like ice on a beach, and everyone’s energy reserves are expended by the middle of the week. Net result? You have an exhausted, unhappy, and increasingly disengaged workforce. The reason for this is simple: creative people need an environment in which their ideas and suggestions are heard and acted upon. In the huge-client / tiny-supplier dynamic, after the initial interaction that secures the business to begin with, there’s usually little room for such a relationship. Massively large organizations typically operate in “broadcast mode”, making their needs known and turning up the volume when they think they’re not getting what they want–not a satisfying environment for highly creative providers to operate in. It happens like this: MegaCo approaches you to with the prospect of a major contract to supply green widgets, which is what you manufacture. Happy days. You negotiate the contract, during which MegaCo insists on a tweak to your manufacturing process so that you can make the widgets in plastic, rather than wood, as you have done in the past. To get the lucrative contract, you accept. Three months later, they insist you start pre-assembling the widgets before shipping. To keep the contract, you agree. A few months after that, they start sending you blodgets from another supplier, which they insist you weld on to your widgets before sending on. Now, a year later, you no longer have a healthy company serving a wide market. Instead you have a Frankenstein of a business whose only real purpose in life is to meet the precise, unique needs of just one customer–MegaCo. 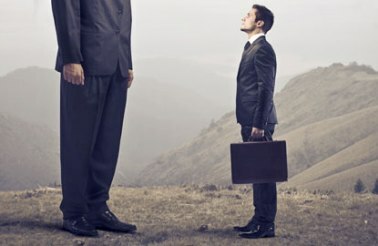 Of course, not everyone’s experience with large contracts with massive companies is like this – some young businesses use them wisely as stepping stones to growth–but if you’re experiencing two or more of the patterns above, it may be time to rethink that contract or think about outsourcing your business development effort to a consultant with experience in your industry.